Classicists and Assyriologists spend a great deal of time and energy editing ancient texts, debating which version to use, and carefully noting which they have chosen. A debate about the use of catapults in fourth-century BCE Greece has reminded me why this matters. A paraphrase of Polyaenus from the sixth to ninth century, however, says that Onomarchus stationed “infantry and stone throwing machines” (pezous kai petrobolous mēchanas) on the heights. The notes to the 1887 Teubner edition of Polyaenus says that the editor of the previous Teubner edition had followed the paraphrase. It is likely that Marsden had read either the previous Teubner editon or the note in the 1887 one but forgot to mention that the manuscripts disagree. Edit 2016-11-25: The fateful page of Marsden’s book. 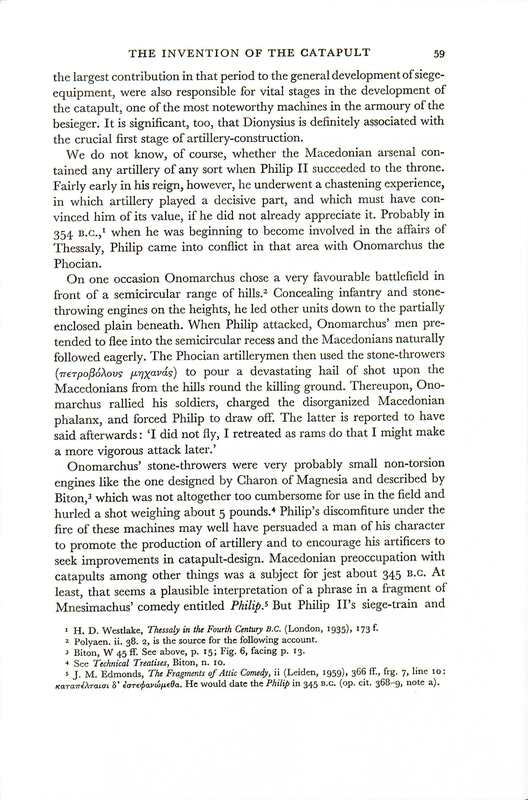 “Concealing infantry and stone-throwing engines on the heights, he lead other units down to the partially enclosed plains beneath” agrees with the Greek of the Byzantine excepts but not with what the main editor thinks Polyaenus himself wrote. This doesn’t really help us know what Polyaenus meant, because the paraphraser often reworded his source to make it clearer, but it does remind me why it is important to check the notes to a Greek text and to cite exactly which version one uses. (The citations are Polyaenus, Strategemata 2.38.2 and Anonymous, Excerpta Polyaenei 36.3 in the TLG text; for a recent discussion of the different versions see the Aris and Philips edition and translation of Polyaenus; an old translation of Polyaenus is here; for Marsden’s loose citation see Greek and Roman Artillery: Historical Development (Oxford: Clarendon Press, 1969) p. 59). Edit 2016-11-30: One modern scholar who follows the 1887 Teubner text and interprets the petroboloi as men not machines is Pritchett, The Greek State at War, Vol. 5 pp. 29, 30.